Alright ladies, let's face it. We all like to smell beautiful, not just for ourselves, but a certain someone in our lives. Sometimes, finding that perfect perfume can be a challenge, especially if you or someone you love has allergies. Over the years, I have had to discard or give away perfumes I loved because my husband just couldn't be near me when I wore them. Since I like wearing fragrances that we both like, this has been a major disappointment to me at times. Don't get me wrong, I have things I keep around just for me (anything lavender, for instance), but it's nice when he goes out of his way to make a comment about how my choice of scents. Recently, I found out that Mia Mariu had a new line of perfumes for both men and women. Since I have never had an issue with any of their products, I was eager to review their new perfume when I was approached about doing a review. If I could find an amazing, sweet smelling perfume that he liked, wouldn't that be wonderful? 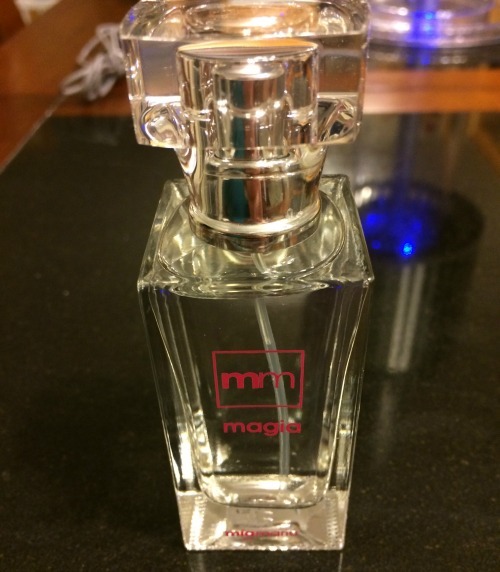 I knew I couldn't be the only lady struggling with this issue, so I was eager to take a risk and see if Mia Mariu's new Magia perfume would be the right perfume for my needs! Looking for a sweet smelling perfume that is delicate, but flirtatious? If so, we think you will love Mia Mariu's new Magia Perfume. This fun perfume is a medley of wonderful fragrances such as strawberry, mandarin, peach, pear, jasmine, plum, and magnolia. With a base note of rich vanilla, musk, tonka bean and warm and enchanting golden amber, you have the perfect perfume for a night on the town or setting the mood for cuddling at home. One thing is for certain, with Mia Mariu Magia Perfume, you will feel like a true princess on your first date or rekindling the romance with your significant other. When it comes to perfumes, I usually have a hard time finding one that I consider mild enough for everyday use that doesn't bother my husband's allergies. Not only did it not bother him, but he loved the sweet smell of Mia Mariu Magia Perfume. I just put a half squirt on my wrists and felt like a queen for the rest of the night, something I really needed after being stuck inside with all of this horrible snow! Even Reya is snuggling with me more since she doesn't seem to mind this perfume. Since I love fruity perfumes, this mix of fruit and flower scents was perfect for me. 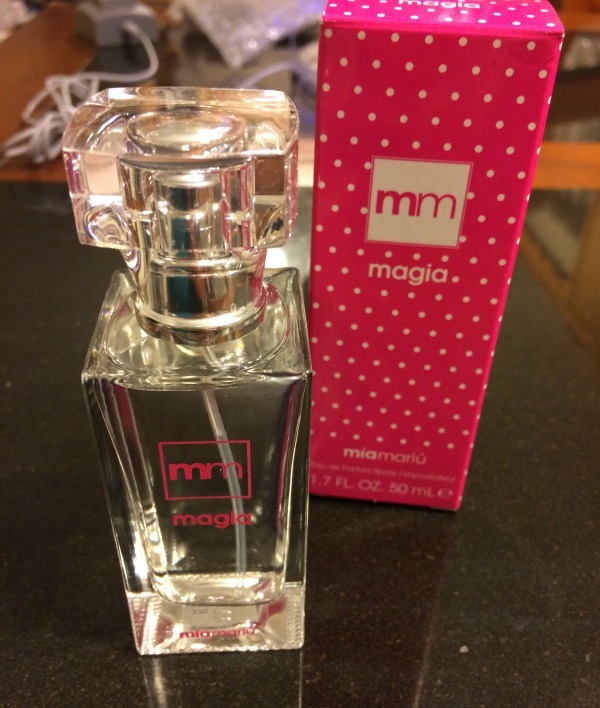 If you like a mild, but sweet perfume, I highly recommend this perfume and delighted to give the Mia Mariu Magia Perfume an A+ rating. Would you love to purchase a bottle of Mia Mariu Magia Perfume? You can purchase this sweet smelling perfume, along with their two new fragrances for men on the Mia Mariu website. Once you have smelled this wonderful, inexpensive sweet perfume, you will see why ladies everywhere love this wonderful new fragrance designed just for women! I'm glad I came across this review. I loooooove perfume but have such a hard time finding sweet or fruity ones I can actually stand. I want to smell nice….not like an actual strawberry….lol. I'm looking forward to getting a wiff of this one. Thanks for the great, in-depth review of this one. I've had my eye on it for a while. I've used the same thing for years but I think I'm ready for a change. That sounds like my kind of perfume. I love fruit and flowery scents that are light. I'd never heard of this before but it sounds like my kind of perfume! This perfume sounds amazing. Thank you for your review.